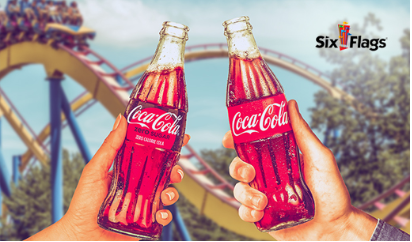 Enter daily for your chance to win the Coca Cola Six Flags Holiday Instant Win Game! Ends December 17, 2018. Good Luck! 2,900 GRAND PRIZES: A 2018 Six Flags Adult Holiday in the Park Ticket, terms and conditions apply. Tickets expire 12/31/18. Tickets will be awarded as a digital code. Digital code and instructions for redemption will be emailed to the email address associated with your Account. Sponsor is not responsible if any scheduled event is delayed, postponed or cancelled for any reason and winner will not be reimbursed for tickets. All expenses, including, without limitation, travel, and other costs not expressly stated in the package description above are the sole responsibility of winner. Restrictions, conditions and limitations may apply. Lost, mutilated, or stolen Codes, tickets, vouchers or certificates will not be replaced. By accepting this prize, winner agrees to abide by any terms, conditions, and restrictions provided by the code or the ticket. Approximate Retail Value (“ARV”) of each Grand Prize: $80.